Highly breathable shoes let your feet "breathe". 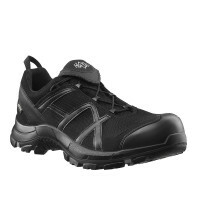 Product information "HAIX Black Eagle Safety 40 Low black/black"
HAIX Black Eagle Safety 40 low black/black are stable and comfortable safety shoes that perfectly complement your workwear. You can wear the shoes just as well in the workshop and when working outdoors. The light work shoes in the new sporty design are waterproof, breathable and provide excellent insulation against heat and cold. The shoes meet the safety requirements of EN ISO 20345 category S3. The safety shoes are ESD-certified and comply with antistatic requirements. The anatomically shaped protective cap on the front of the safety shoe reduces the risk of objects damaging your feet and toes. It consists of glass fibre reinforced plastic and is substantially lighter than a conventional steel cap. 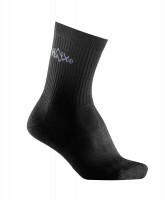 The HAIX Climate System makes use of the pumping movements generated as you walk to transport moisture to openings located at the shaft and tongue, providing a pleasant climate feeling inside the shoe. They are metal-free and therefore extremely light. Thanks to the GORE-TEX® membrane, the shoes are waterproof: prevents rain or snow from penetrating. At the same time, they are breathable. Thanks to the breathable material, warm and moist air is reliably discharged to the outside. The outsole of the shoes is slip resistant and has a pronounced profile. 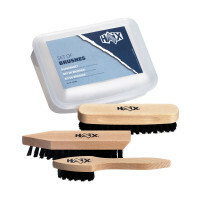 This ensures a secure hold, even on wet, smooth or oily surfaces. The rubber outsole is self-cleaning. The sole is very resistant thanks to the special rubber compound. So you can enjoy your shoes for a long time.